Kevin Harvick drives the No. 4 Stewart-Haas Racing Chevrolet during testing at Charlotte Motor Speedway. Kevin Harvick said he was eager to get started with his new team, Stewart-Haas Racing, and his new crew chief, Rodney Childers, and he wasn’t kidding. 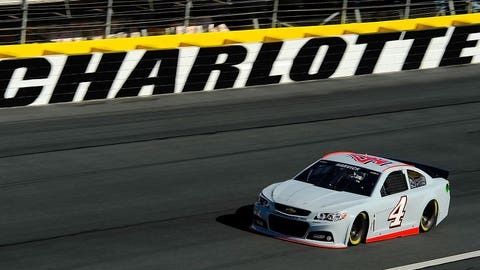 Harvick was the unofficial star of the show at Charlotte Motor Speedway on Wednesday, where NASCAR conducted testing to determine its 2014 aerodynamic rules packages. All told, the teams ran five simulated sprint races, with Harvick winning three of them and finishing second and third in the other two in his No. 4 SHR Chevrolet SS. "It’s like that roller coaster that you ride for the first time," Harvick said. "You want that thrill and that excitement of the unknown. There’s obviously a lot of unknowns that we’ll learn and adjust for, but I feel like I’ve developed a good relationship with Rodney." At CMS, the teams ran four simulated 30-lap races and one 15-lap race, in a variety of configurations, with tweaks to spoilers, radiator pans, roof pans, rear fascia and the front splitter. 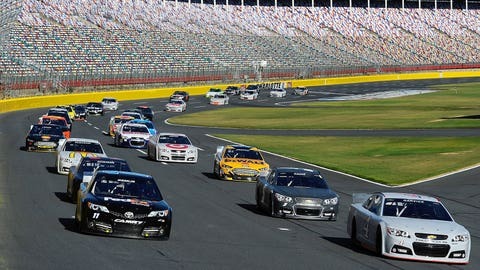 Teams ran four simulated 30-lap races and one 15-lap race during testing at Charlotte Motor Speedway. For one of the 30-lap races, the cars were fitted with tapered spacers to reduce horsepower from roughly 850-900 in normal configuration to about 750 horsepower. After each of the race simulations, NASCAR officials met privately with all of the drivers, crew chiefs and manufacturers’ reps to debrief and compare notes on how they thought that particular test went. All told, there were 30 cars that took part in the test, with an eye on improving competition, specifically on the 1.5-mile tracks that make up roughly one-third of the NASCAR Sprint Cup schedule. "Really what we’re attempting to do here is to get closer competition and more passing, closer competition, the cars running closer in the pack, passing more with an eye for the fans," said Gene Stefanyshyn, NASCAR’s vice president of innovation and racing development. "That’s basically what we’re doing." Stefanyshyn said NASCAR has a variety of subjective and objective tools to measure just how close the competition is or isn’t. 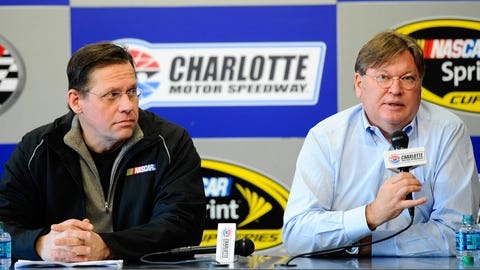 Gene Stefanyshyn (left), NASCAR’s vice president of innovation and racing development, and NASCAR vice president Robin Pemberton address reporters at Charlotte Motor Speedway. "We’re using various metrics to look at that, like the first-to-fifth time differentials, the time differentials between the 10 fastest laps, those types of things," he said. "Those are the types of metrics. There’s many more, but that’s just an example." NASCAR tested at CMS earlier this year with just six cars, but by running 30 cars, series officials could get a more accurate representation of actual racing conditions. "One of the things that we learned and the reason we’re back here with so many cars is it is different when you have 30 cars or 25 cars out there versus the six," said NASCAR vice president of competition Robin Pemberton. "It was important for us to come back here with a field of cars that we did. It gave us a little bit different view on some of the answers. It’s put us in some different directions. We’ll just continue to work on it." "Really what it comes down to is 30 cars running around the track and seeing how it all works and measuring that," added Stefanyshyn. "That’s kind of the nature of the work."